Pink Ribbon believes in building partnerships & collaborations with corporates having peculiar focus on the cause of Breast Cancer and especially in setting up the Pakistan’s first dedicated Breast Cancer Hospital. We truly acknowledge each partner of Pink Ribbon and ensure every partnership we enter into is mutually beneficial and enhances our strength to fight against breast cancer. Partner with the most trusted social campaign with high levels of brand credibility and leverage media and PR opportunities. 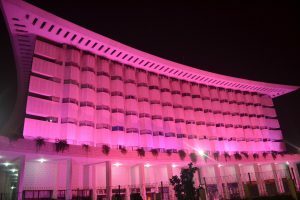 Your staff, customers and stakeholders can participate in Pakistan’s largest breast cancer awareness campaign. How can you partner with Pink Ribbon? You can directly donate to Pink Ribbon as part of your Annual Giving’s. Donate building items you manufacture to support the construction of the Breast Cancer Hospital. You can sponsor our on-going programs and nationwide campaigns. You can donate a percentage of sales of your product to Pink Ribbon on a permanent basis or for certain time period. You can celebrate ‘SINK IN PINK’ day with your staff and encourage them to wear pink that day and make a donation. Engage your staff to donate their ‘ONE DAY SALARY’ to Pink Ribbon and the company can match their employees payroll giving. You can purchase Pink Ribbon Merchandise for your staff and help us raise funds through that. Please click here to view our pink products.